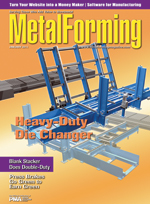 A heavy-duty two-position die cart with a retractable bridge extension improves die-locating repeatability while enabling a 70-percent reduction in die-change time at a Metalsa (formerly Dana) automotive plant. A two-out continuous-run blank-stacking system allows this Honda supplier to eliminate work-in-process blank inventory. An added bonus: One of the systems new belt conveyors tilts up and out of the so the press can run progressive dies. Next-generation hybrid and electric press brakes are lean, green production machines that provide clean, quiet and accurate operation, while lending support to a shop's bottom line. ...that not only invites prospective customers to learn more about your capabilities and strengths, but also convinces them that an onsite visit is a must. After that, let the revenue build.